Background Community pharmacists have an important task in the follow-up of patients treated with antithrombotics. When delivering these medicines, pharmacists can encounter drug–related problems (DRPs) with substantial clinical and economic impact. Objective To investigate the amount and type of antithrombotic related DRPs as well as how community pharmacists handled these DRPs. Setting Belgian community pharmacies. 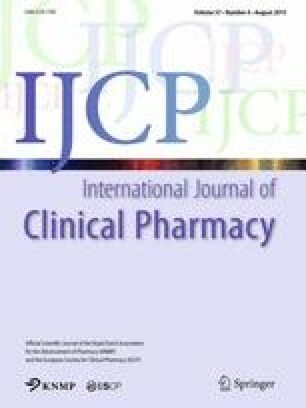 Methods MSc pharmacy students of six Belgian universities collected data about all DRPs encountered by a pharmacist during ten half days of their pharmacy internship. Data were registered about DRPs detected at delivery and in an a posteriori setting, when consulting the medical history of the patient. Classification of the DRP, cause of the DRP, intervention and result of the intervention were registered. Main outcome measure Amount and type of antotrombitocs related DRPs occurring in community pharmacies, as well as how community pharmacists handled these DRPs. Results 3.1 % of the 15,952 registered DRPs concerned antithrombotics. 79.3 % of these DRPs were detected at delivery and 20.7 % were detected a posteriori. Most antithrombotic-related DRPs concerned problems with the choice of the drug (mainly because of drug–drug interactions) or concerned logistic problems. Almost 80 % of the antithrombotic-related DRPs were followed by an intervention of the pharmacist, mainly at the patient’s level, resulting in 90.1 % of these DRPs partially or totally solved. Conclusion Different DRPs with antithrombotic medication occurred in Belgian community pharmacies. About 20 % was detected in an a posteriori setting, showing the benefit of medication review. Many of the encountered DRPs were of technical nature (60.7 %). These DRPs were time-consuming for the pharmacist to resolve and should be prevented. Most of the DRPs could be solved, demonstrating the added value of the community pharmacist as first line healthcare provider. On behalf of the DRP-studygroup. S. Desmaele and I. De Wulf are joined first authors and they have contributed equally to this study. A. G. Dupont and S. Steurbaut are joined last authors and they have contributed equally to this study. Members of the DRP-studygroup are members are K. Putman, F. Puttemans, K. Boussery, G.R.Y. De Meyer, C. De Vriese, V. Foulon, V. Lacour and T. Van Hees. We would like to thank the participating pharmacies and students for their effort. We are also grateful to the department of statistics of APB for providing the raw data for this study. APB supported this study by providing logistic support for this study and by developing the electronic tool for registration of the DRPs. The primary investigator was supported by an unrestricted grant from Bayer NV-SA. PCNE. Classification for drug related problems V6.2. [Internet] Zuidlaren, NL: Pharmaceutical care network Europe foundation; 2010 [cited 2015 2015-02-02]; Available from: http://www.pcne.org/upload/files/11_PCNE_classification_V6-2.pdf. WHO. ATC/DDD Index. [Internet] Oslo, Norway: WHO Collaborating Centre for Drug Statistics Methodology; 2014 [updated 2013-12-19; cited 2014 2014-03-10]; Available from: http://www.whocc.no/.